Here’s a great way to dress up your KitchenAid mixer, and to make it even more practical and convenient. 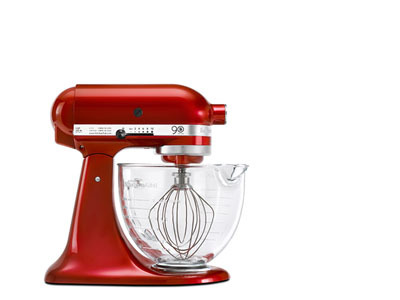 Until now available only with the special-edition 90th Anniversary Artisam mixer, this heavy glass bowl is now sold separately and will fit all KitchenAid 4.5-qt. & 5-qt. tilt-head mixers. Not only does the glass bowl look really cool, it’s actually far more practical than the metal bowl that came with your mixer. It has graduated measurement markings up to 12 cups, so you can see (it’s glass!) the amount of ingredients in the bowl. The built-in handle and drip-proof pouring spout let you pour directly from the bowl, and since the bowl is glass, you can heat sauces or toppings in the microwave after mixing. 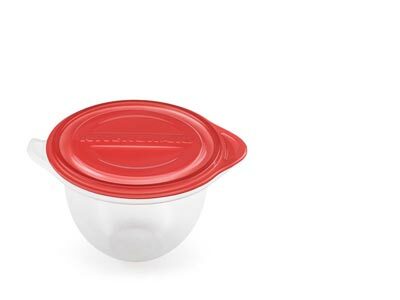 Of course, you can check the progress of mixing at a glance in the glass bowl and the tight-fitting lid lets you store batters or sauces in the fridge after mixing. Kitchenaid Stand Mixer Bowl Liner (2 pack) are reusable PBA-free bowl liners and lids; Freezer, dishwasher and microwave safe; fits 4.5 quart and 5 quart Kitchenaid stainless steel tilt-head mixer bowls.